In a November post, Comminatory Weather and the Big Save, I described how I saved two Swallowtail butterfly caterpillars from a hard freeze in my garden. 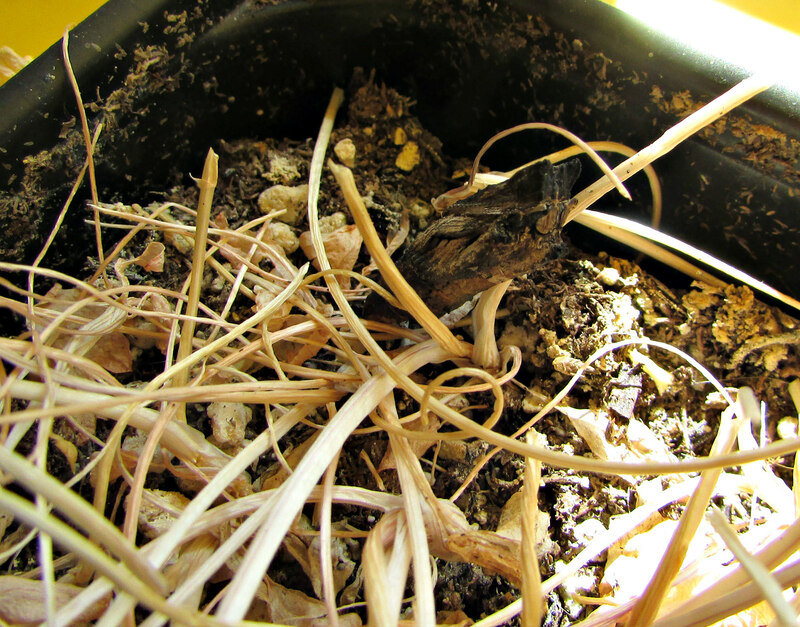 One didn’t make it, but the other formed a chrysalis which has rested on the soil of a dried out pot of dill for several months. I left it alone for the most part, only dripping a bit of water on it now and then when I watered my plants. 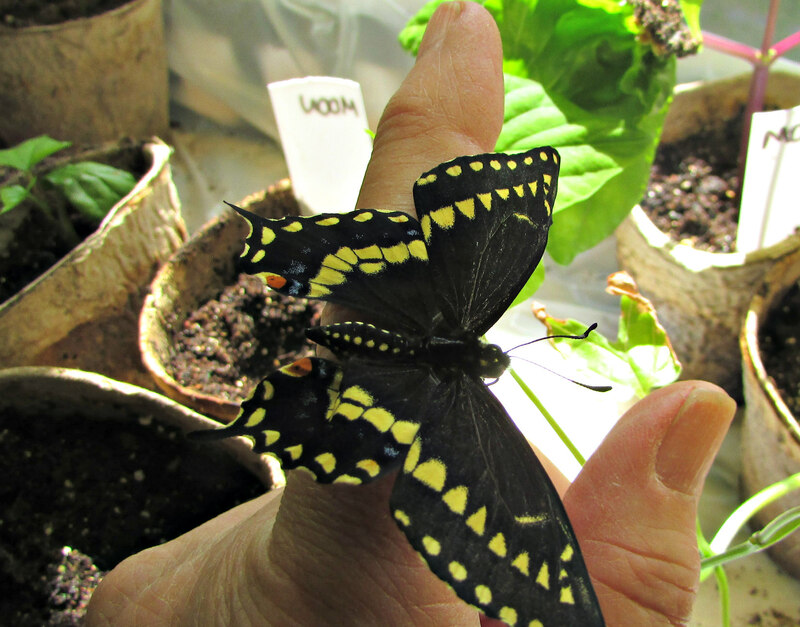 Today when I entered the room and checked on my garden seedlings, something fluttered and flew off the pot; I knew right away the caterpillar had changed into a butterfly. I extended a finger, nudged his legs, and he walked on. If he had emerged in the midst of cold weather I would have tried to craft several fake flowers connected to jars of sugar water for him to survive on, but since it has warmed up and there are many flowers and trees blooming, I knew outdoors was his best chance. 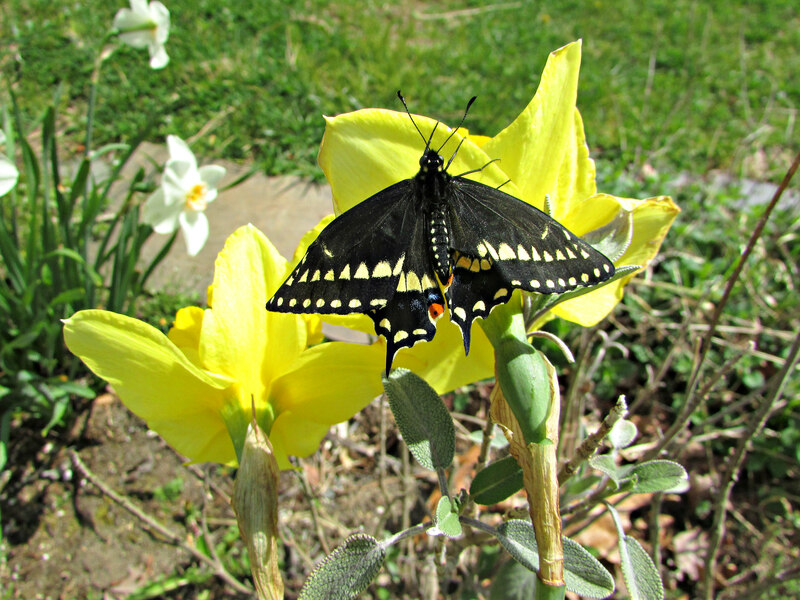 I took him to the garden and gently let him move onto the edge of a daffodil. He looked happy until I moved and then he flew about twenty feet out into the yard. He flew fine, but it seemed one of his bottom wings was not quite extended all the way. He rested on the grass for quite awhile, flying now and then several feet one way then another. Suddenly, he extended his wings, flew, and was quickly out of sight. I was thrilled. Every day is blessed when it contains a small miracle or two. Part 2 of my small miracle day will be posted tomorrow. Thank you for posting this. I love it. I am on the lookout for butterflies too so this warms my heart. We will wait and see whether he returns to his winter home( your room). I saw one too- and at my university. This is my second one in this country. Is it something in the environment that we are seeing more butterflies? It is a miracle indeed. Oh wonderful.!! He needed the warm sunshine to finish off the wings. Nature is so much fun to watch. That is probably so true…my house is still cool inside. The warmth of the sun really brought him to life quickly. That was a lovely rescue of a butterfly. I was so pleased it survived. P.S. I liked your youtube video. Thank so much Janie. I had some doubts if it would emerge, but oh the joy of the moment I realized our efforts to save it were not in vain. Your diligent occasional sprinkling of water on the chrysalis made the big difference and allowed this beautiful creature to transition. Yeah, I believe it was after you let us know about your “guests” beginning chrysalis state, I went researching on the internet so you would have a positive outcome. And it worked! Yay! What do I love about blogging? Conversations such as this with blogging friends. How wonderful to make good use of technology. Forming friendships with people all over the world, exchanging ideas and anecdotes, receiving good advice, life is good! How wonderful!! Your post brought a smile to my face. Thank…I still smile when I think of the butterfly. I probably always will. So beautiful! I love how you saved that beauty. How awesome is that!! Thank you for sharing this!! I love that you rescued this little butterfly. Your photos are beautiful! Thanks so much…it was a really good day!